The Skyline Hotel & Waterpark continues to build on its family friendly reputation thanks to the hotel’s ideal location on Falls Avenue Resort home to the 3 acre Fallsview Indoor Waterpark, superb guest service and exceptional amenities. This newly renovated hotel features all of the comforts of home. The Skyline Hotel & Waterpark offers guests a variety of amenities designed to make your stay pleasant within the tourist district. Free wireless internet is available throughout the hotel to help you stay connected during your stay. The Perkins Family Restaurant is directly attached to the hotel and offers a wide selection for breakfast, lunch and dinner menu items that will please all appetites. 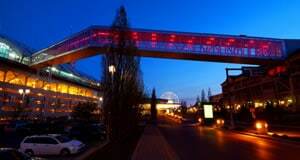 The Skyline Hotel & Waterpark is located at the front steps to Casino Niagara – home to over 45 gaming tables, 1700 slot machines, video gaming terminals and restaurants. From the location on the Casino Niagara complex to on-site amenities, this hotel will delight guests. The enclosed, climate controlled courtyards offer a quiet place to sit with a book, or coffee and a paper. Take a seat in one of the courtyards Gazebo’s and relax. All of 206 rooms of the Skyline Hotel & Waterpark feature a long list of updated room amenities to make your stay at the hotel comfortable. 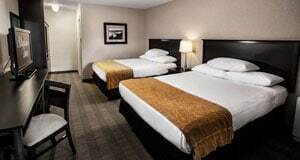 The Skyline Hotel & Waterpark also offers spacious family bunk bed suites that can accommodate up to 6 guests and feature two queen beds, and bunk beds in a divided sleeping area that allow for limited privacy. 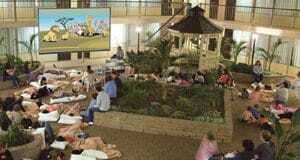 Guests of the Skyline Hotel & Waterpark can enjoy a movie in comfort, pyjama-style! Every night that the Fallsview Indoor Waterpark is open families are encouraged to bring their blankets, pillows and munchies to the indoor courtyard to watch a current family movie. The entire family will enjoy watching movies in the courtyard that is turned into a giant “living room” with an extra large movie screen. Children are encouraged to set up camp, and unwind after a busy day of sightseeing and splashing in the Fallsview Indoor Waterpark. Movies are available to guests of the Skyline Hotel & Waterpark most nights throughout the year when the Waterpark is open, and are rotated to ensure that guests staying multiple nights can enjoy more than one movie. The Skyline Hotel & Waterpark Front Desk can provide times and movie titles of the feature films playing during your stay. When staying at the Skyline Hotel & Waterpark, kids can stay and eat for free! Dine at Perkins Restaurant to qualify to receive one Kid’s Meal including beverage for each adult entree with beverage purchased, available after 1pm. The Front desk staff is more than happy to help answer any questions, give advice assist with tour arrangements, or render services that you may need. The exceptional staff at the Skyline Hotel & Waterpark hopes to make your stay enjoyable and we look forward to welcoming you.